Hamilton's entry-level models of the 1950's and 60's featured Swiss-made movements cased in rolled gold plated bezels with stainless steel backs. These models were intended to compete with the myriad European watches in the US market. Just because the watches were entry-level, that doesn't mean they weren't high quality. However, what they lacked in higher end movements or case materials, they made up for with unique design aesthetics and bracelets. A good example is the 1958 Boatswain. 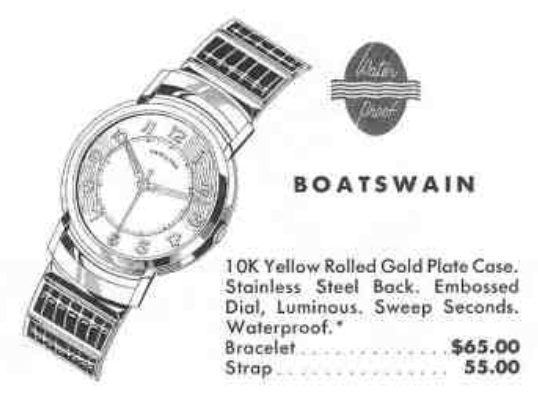 The 1958 Boatswain was produced for three years. It's the first of three different Boatswain models, the others being the Boatswain II and III, introduced in the 1960's. The original Boatswain featured a unique embossed dial with luminous dots and matching hands. You could get it with a leather strap or a unique leather and metal expansion bracelet. Under the dial is a 17 jewel Hamilton 671 sweep second hand movement. I recently purchased a Boatswain that was listed in "serviced" condition but I've grown to be suspicious about how recently serviced "serviced" watches really are. It arrived in decent condition overall. The only distraction is there is a faint radium burn on the dial from the hands being in the same position for numerous years. The back of the watch is bright and clean. This style of back has a cover that is held in place with a ring that screws down into the bezel, clamping the cover down at the same time. The backs of the lugs are worn through - so this was a well-used watch at some point. It must have stopped working and sat for many years - thus burning the finish on the dial. The movement is also bright and shiny. The gasket under the cover is in good condition and still very flexible - a good indication it's not very old. The inside of the cover is marked 11/11 in sharpie so I would guess this watch was last serviced in 2011... I guess that's "recent". I decided to overhaul it anyway - as then I'll know the watch is in serviced condition. Once it's reassembled, it goes onto the timer. A little tweaking to the regulator gets it to even out just a smidge fast at 3 seconds fast per day. I'll take the time to replace the crystal with a fresh one. Plastic crystals can be polished to look new but they are easy to replace and after a while, that's the best thing to do. And here's the finished project, on a new strap that won't tear into the lugs like an expansion bracelet will. I relumed the hands with non-radium material so there's no risk to burning the dial again. The burn lightened a little when I cleaned the dial but it's still there. The dial has so much going on, design wise, that you don't really notice the burn unless you really look for it. You can see it if you imagine the hands at the 5:07 position. Fantastic restoration work on this watch! I just picked up a 1958 Hamilton Boatswain movement, with original dial and hands, but no case. Hopefully, I'll find one someday. Thanks to your posting, I know what to look for!